New Russian Arctic Route to connect Europe to Asia-Pacific? As the melting of Arctic sea ice broke records this summer, Russia’s arctic revival plan moved a step forward. Last month Russia set up its new floating research station, North Pole-40, to replace the previous one. Two new icebreakers also went into service. Moreover, in the budget for the next two years the Russian Department of Finance has included 100 billion rubles ($3.2 billion; 2.5 billion euros) to build three nuclear-powered icebreakers. This year Vladimir Putin was elected president again, and the country joined the World Trade Organization and hosted the Asia-Pacific Economic Cooperation summit. It is against this backdrop that Russia’s Arctic revival plan has begun to advance, something that is important to China and many other countries. In September last year at an international forum in the northern city of Arkhangelsk Putin proclaimed that Russia plans to turn the Northern Sea Route into one of the most important trade routes, something with global implications comparable to the Suez Canal. “I want to stress the importance of the Northern Sea route as an international transport artery that will rival traditional trade lanes in service fees, security and quality,” he said. Indeed, this route is the shortest route that connects Europe and the Asian-Pacific region, which are two large markets, and it is much shorter than the traditional southern ones. Russian leaders have recognized their country’s prospects in the development of the Arctic and they hope to seize the historic opportunity resulting from the rapid melting of Arctic sea ice. Russia’s economy has long relied on energy, but in an economic sense being merely a resource supplier cannot help Russia realize its dream of being a global power. Developing and using the Northern Sea Route may form a new economic belt with the help of the shipping industry along the Arctic Ocean. Considering the scope for shipping Arctic resources, such an outcome is highly likely. Russia has the longest coastal line along the Arctic passage as well as ample experience of domestic shipping. The country’s shipping equipment and services in the Arctic provide a good platform for Arctic shipping. But that is far from enough. For all of this to work internationally and to satisfy market demands for efficiency, Russia needs to work with other countries. The first issue is infrastructure. Russia has to rebuild or upgrade its worn seaports and their equipment. River ports, highways, railroads and airports need modernizing. Second, Russia has to ensure effective and prompt icebreaking and aid services. 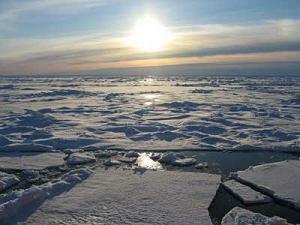 It plans to establish 10 Arctic aid centers in its northern regions by 2015. In addition to the existing 10 icebreakers, it plans to build three nuclear-powered icebreakers and six diesel-electricity hybrid-powered icebreakers. Third, Russia must raise the efficiency of its shipping services and reduce service charges. The current high navigating and icebreaking service fee and inefficient service arrangements make it impossible to enable states and private companies that choose the Arctic trade routes to reap the economic advantages. Russia should take advantage of its entry to the WTO and raise the quality of its service, expand the scope of the service and reduce charges. Fourth, Russia still has to find new sources of financing and labor to build the new infrastructure. The fifth issue is how to protect the environment even as resources and routes are developed, so that, as Putin put it, there is a “rational and reasonable balance between economic interest and the mission to protect nature”. Russia’s top leaders have clearly recognized the new opportunities that developing the Arctic brings to Russia. Yet some government departments are not quite on the same page. Problems such as inefficiency and excessive checks exist in the Russian government. Other possible obstacles to opening up the Northern Sea Route are legal and judicial. Russia claims sovereignty in several straits along the Northern Sea Route, but these claims are highly controversial among different countries. Russia needs to find a way in which sovereignty disputes can be put on hold and the Arctic is used together. It has to avoid setting recognition of some straits as its internal sea as a precondition of the passage of foreign ships, which would significantly prolong the realization to fully exploiting the Northern Sea Route. From the perspective of Russia, development of the Arctic still has a long way to go. In order for it to turn the Northern Sea Route into a trade route with global benefits, besides providing necessary infrastructure and shipping services, Russia must change its attitude and separate economic issues from sovereignty and security issues. In order to make the Northern Sea Route a link in the global economy, mechanisms of multiparty coordination must be set up, and real sharing has to be achieved. The successful experience of China’s opening up says that development is the only way. From the perspective of the global economy, the world should provide more encouragement and help to Russian’s Arctic revival plan. Using Russia’s Northern Sea Route creates new opportunities for global economic growth after the recovery. The west coast of North America, China, other northeastern Asian countries and Europe will all benefit from the route. As a country with a large trading volume, China has considerable hope for the establishment of the cost-saving Arctic passages. China has funding and experience in the building of shipping infrastructure. It is willing to cooperate with all Arctic countries, including Russia, to exploit and protect Arctic resources and build the Arctic routes. The author is vice-president of Shanghai Institutes for International Studies. The views do not necessarily reflect those of China Daily.